CELEBRATE FOUR DECADES OF BLACKFOOT'S STRIKES! FEATURES SMASH ROCK TRACKS: "I GOT A LINE ON YOU" "TRAIN TRAIN" "HIGHWAY SONG" & "WISHING WELL"
In 1979, hard rockers Blackfoot were awarded by Atco Records with their first platinum plus album "Strikes." Featuring superstars Rick Medlocke (Lynyrd Skynyrd), Jackson Spires, Charlie Hargrett & Greg T. Walker, "Strikes" has become one of the most important hard rock albums of the classic rock era. With Blackfoot rockers like "Train, Train" & "Highway Song", plus stellar interpretations of Spirit's "I Got A Line On You" & Free's "Wishing Well", this amazing Lp sounds and feels like a Greatest Hits album due to the popularity of each song. The original vinyl masterpiece has been out of circulation for decades...that is until now! 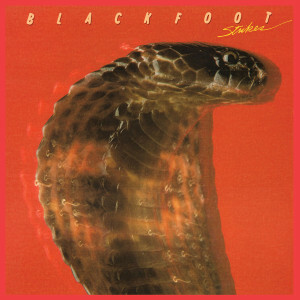 Friday Music is pleased to announce the first time ever 180 Gram Audiophile release of Blackfoot's "Strikes." Mastered impeccably by Joe Reagoso at Friday Music Studios & Capitol Mastering. In honor of the upcoming 40th Year Anniversary of this Lp, we are pressing this for a limited time on translucent red vinyl, featuring the album sized graphics not seen in years. In 1979, the hard rockers Blackfoot were rewarded by their label Atco Records with their first platinum plus album Strikes. Featuring the classic line-up of Rick Medlocke (Lynyrd Skynyrd) on lead guitar and lead vocals, Jackson Spires (drums), Charlie Hargrett (guitar,) and Greg T. Walker (bass), Strikes has become one of the most important hard rock albums of the classic rock era. With Blackfoot mega-standards like Train, Train and Highway Song, plus the stellar interpretations of Spirit's I Got A Line On You & Free's Wishing Well, this amazing album sounds and feels like a Greatest Hits album due to the popularity of each song, thanks to its heavy radio and retail chart action. The original version of this vinyl masterpiece has been out of circulation for decades...that is until now! Friday Music is pleased to announce for the first time on 180 Gram Audiophile Blackfoot's classic Strikes. Mastered impeccably by Joe Reagoso (Lynyrd Skynyrd, Kansas, Deep Purple) at Friday Music Studios and Capitol Mastering, this stunning LP was long overdue for the audiophile vinyl domain. In honor of the upcoming 40th Year Anniversary of this amazing Lp, we are pressing this for a very limited time on stunning translucent red vinyl, featuring the original Lp sized graphics not seen in years, and of course the five star mastering of this wonderful rock masterwork. We believe this revered new audiophile release of Blackfoot's Strikes will become one of the more anticipated classic hard rock releases of the year! Enjoy!